If you don’t know what you want then how can you get what you want? Seems painfully obvious doesn’t it? Unfortunately, I’ve been in enough goal setting consultations so know that most people don’t have a clue what they want. It may seem obvious, but the first step to developing a great plan is knowing what you want. And how do we find out what we want? Below, I am going to go over a simple brainstorming technique. You can do it on paper or a text file, but I’d recommend using our free online goal setting tool. That way, your work won’t get lost or damaged. Did you know most people walking around out there don’t even know what they want out of life? Again, how can you get what you want if you don’t even know what you want? That’s why this step is so important. You need to know what you want in order to get it. 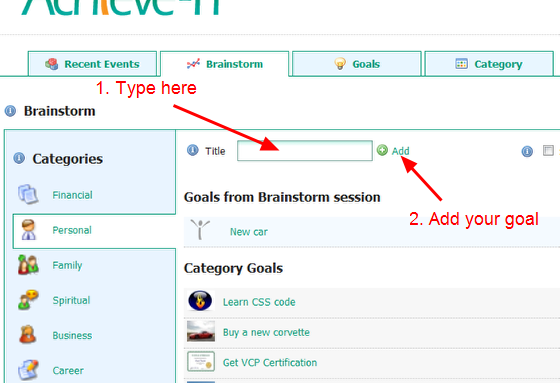 The brainstorm module is the page where you begin setting goals. You get to it by clicking on the Brainstorm tab. You see a list of categories on the left and an area to add your goals in the middle. All you do is choose a category and start adding goals as fast as you can. Don’t worry about spelling or punctuation. Just make a long list. Spend a good 30-45 minutes listing everything you want out of life. Set some money goals, set some education goals, set some vacation goals. Try to get everything recorded by simply typing them in and clicking the “add” button. You’ll see the goal appear in the list below the textbox. You can also choose a new category and can add goals there too. Try to fill in each category with a long list of goals. Don’t settle for 1 or 2. Get a long list. The sky is the limit. To repeat, how will you get what you want if you don’t know what you want? Also, do not worry about how you’ll achieve them. Just get everything on the list. Side note: When I first did this exercise years ago, I had 75 goals on my list. I have achieved almost all of those goals (with the exception of appearing on The Late Show with David Letterman LOL; still working on that one). You’ll achieve your goals too. If you start out right – and know what your goals are. Another side benefit of getting everything down is it clears your mind. After you complete this step, you will be highly motivated and ready for action. It puts in perspective what’s important to you vs. what’s just noise. This is a great way to set goal up. The key is to take action in order to achieve your desires. This is what you have to do. Its great to have a road map to your destination. But if you don’t take that drive and pack for emergencies, then your just wasitng your time and diluting efforts. You have written quite helpful article for many people who do not know what they want even they get into practical life. They are not even satisfied from their jobs and look for something which they actually don’t know themselves that what they are looking for? You have summarized the whole thing in a good perspective of brainstorming. I would suggest that everyone must give it a try at least once. What a great post. It is very important to set a goal and stick to it. Keeping yourself motivated, while motivating others along the way, is a great way to go. Seems like a great tool that will go far. Wow, this is really cool and exactly what I need to get myself organized along with the many projects I have on my plate! Thanks! Action is always better than inaction, organized action produces even better results…my daughter uses the tools online and she has changed her life dramatically. Yeah this is the stuff! Goal setting is one of those things they should teach in school – the human race would be so much more efficient if it were. The dangest thing about goal setting is that setting goals is a goal in itself, so if we’re not inclined or motivated to do even that…. Procrastination is the killer. (There is always something better to do, right? Like play freecell.) I still suffer from it occasionally. A technique that helps me break through this is to visualize the outcomes I want to manifest – see the results in my minds eye. This helps me get the ‘inner juices’ flowing and to develop motivation to get started. If procrastination is something you suffer from, give this a try. It has roots in Neuro-Lingsuistic Programming, so it’s a bone-i-fied technique! where i work we try and focus on setting goals for eachother and we even put them up on the whiteboard for every project we work on. Its great way to work as a team. Interesting tool, I will check it out. Most people have a general idea as to what they want, however, I believe most just don’t have a clue how to get what they want, and therefore it stumps them in their tracks. Traffic to a website for example, many people know that is important, and they want to learn how to do it, however, they get so overwhelmed with the “how-to’s” that they literally become paralyzed and do nothing. Setting goals can only be made possible when you know what it is you are trying to achieve, and it helps to know what to do in order to make it happen! amazing!!!! never thought something like this exist. what I always do is the tradional way of just thinking. being alone and just think. but this is fun. thanks for this!